Gel 2 Review | Gel II UK Review | Is Gel 2 Any Good? So I’m just in receipt of some of the brand new Gel II Foggy London Collection gel polishes! Now when I first saw these advertised in Scratch Magazine earlier this year I was really interested. Unlike other brands of gel polish, Gel 2 is a 2 stage polish so there’s no need to apply base coat and up to 3 weeks wear, this intrigued me! Some people may know my history in the industry, but incase you don’t, I am a CND Grand Master, winner of CND Shellac Power Polisher 2013 and a former CND Shellac Education Ambassador. 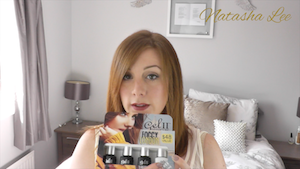 So for me to try a different brand of gel polish was a pretty big deal and a step outside of my regular comfort zone, but as I always promise honest reviews, here is what my first impressions are in my Gel 2 review. Now previously I was an incredibly naughty girl in how I treated my own nails as I knew I had the tools and skills to cover up my misdemeanours. Consequently I temporarily damaged them and I am now growing out that damage. For the past year I have not been able to get any longer than 4/5 days from my CND Shellac before signs appeared of chipping and lifting. Sometimes there would be a little chip within 24 hours. I am going to use this as my benchmark for assessing how well the Gel II performs and see if I can get longer than 5 days before there are signs of a service breakdown. 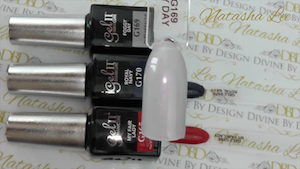 I was sent a selection of 3 of the colours from the Foggy London Collection, and these were My Fair Lady, Foggy Day & Royal Navy. Also included in the pack was a bottle of Shine Xtreme Top Coat. My Fair Lady is a red with an amber-toned base to it as opposed to a blue base. Royal Navy is an absolutely perfect cream navy blue, and Foggy day is a beautiful pale dove grey with a rose pink shimmer running through it when it catches the light. I decided to use Foggy Day for my review because I’m a sucker for a bit of sparkle! 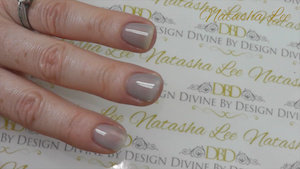 Just for those wanting a close up, here’s some swatches of the 3 colours from the Foggy London Collection. Now the official manufacturers guidelines state, that following cuticle work and before cleansing, the nails should be lightly buffed with a 300 grit file. I’m normally a stickler for following the rules, but I know a number of Gel II techs are getting fantastic wear without buffing, and as I am wanting to repair the damage I have previously done to my nails, I was naughty and decided not to buff before application. I am well aware that this may have an effect on the service longevity, but I will take that into consideration. Also, just for my own intrigue, I thought it would give me a good idea of the Shellac Vs Gel II angle. First impression on the product from the outside was that I wan’t too sure of the bottle design and labelling, but I did like the Gel II embossing down the side. Also, as the handles are slightly textured, they were really easy to open even with moisturiser on my hands. On removing the lid, the Gel 2 itself seems to have a lovely creamy rich viscosity, quite unlike any of the other gel polishes I have tried. It’s not thick in a negative way, but it’s not thin and runny and hard to control either. I was expecting it to have quite a strong odour like Gelish with it being a gel polish, but it didn’t. There is a very slight odour, but not particularly noticeable and you have to get very close intentionally to be able to detect it. The bottles are deceptive in how much they carry (14ml). 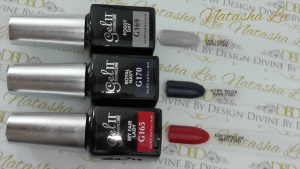 They are almost double the size of a CND Shellac bottle (7.3ml), and just 1ml smaller than a Gelish bottle (15ml). I need to confirm the costings per service for the UK market before I can compare pricings, but you will need to take into consideration the time and materials saved with not having to apply a base coat when working it out. The UK Distributor is due to be announced in the next fortnight around the time of Olympia Beauty 2014 in London. How To Apply Gel II? After carrying out cuticle work, the manufacturers guidelines state that you should buff the nails with a 300 grit file and then cleanse with Gel II cleanser. However, as I’ve heard some great feedback from existing techs already using Gel II, I decided not to buff my own nails, but I will take this into consideration with how long it lasts. I also haven’t got my hands on any Gel II Cleanser yet, so instead I used Scrubfresh. Also it is important to know that you only need to roll the bottles between your hands to mix up the ingredients, DO NOT “Shake It Like A Polaroid Picture” as that can result in bubbling and shrinkage. Simples! 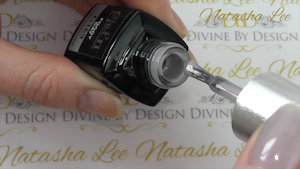 Once you’ve cleansed the nails, you can go straight into painting on your first colour coat! This feels very strange and decidedly naughty to me as I’m so indoctrinated about the importance of applying base coat! Apply a neat, thin even coat over then nail ensuring that you a margin ideally less than 1mm between the skin and polish and remember to cap the free edge. Once that’s done, it’s time to cure it. If you have a Gel II LED lamp, then it’s just 30 seconds in the lamp. However, I was using my CND UV lamp so the curing time is 2 minutes. After you have cured your first coat, apply the second coat exactly the same way and cure for the times stated above. Then it’s just a nice thin layer of top coat and cure! Done! If you are using the Shine Xtreme Top Coat, then you will need to remove the sticky top film from the polish, and you can do this with Isopropyl Alcohol 70%+ or I used Scrubfresh as it has a small amount of acetone in it and this top coat is acetone resistant. *wait 5 seconds after removing the nails from the lamp before wiping off the sticky layer* Then just apply your cuticle oil and you are done! It pains me to admit, but a part of me really didn’t want to like Gel 2. I’ve invested so much money into CND & CND Shellac that I don’t want to have to stick with it knowing it’s not as good as another product available. However, on my first impressions, I am really loving Gel 2! Now obviously the jury is still out as I don’t know yet how it will last, but if it lasts on me longer than 5 days and without me having to buff my nails, then I’m going to have to seriously consider my position as an exclusive CND salon, which is a scary thought, but I pride myself on striving to offer my clients the best products. I will also have to wait and see what removal is like, and I will do another post on that, but feedback I’ve had from a tech I trust, is that removal is surprisingly easy! The application is a dream and basically fool proof, and the product has a beautiful, intuitive feel to it when applying. It also seems to self level perfectly and covers up imperfections in the nail surface as I have a few file dints from work, but these are not visible with the Gel 2 on. Coverage appears good on the 3 colours that I have, but again, without more of the range to trial, I couldn’t say if they are all that good. The top coat is beautifully shiny, and the finish is thin and perfectly even. My nails are normally very flexible and yet they feel strong and resilient! One bizarre thing I noticed, was that for the first time ever, I did not have an attack of the “fluffies”! Fluff in my Shellac is the bane of my life in the salon when you are on tight time constraints, but for some unknown reason, it was only when I finished I realised I hadn’t had any fluffies. Could be a coincidence, but either way, it made the whole experience of application more pleasurable. 1 Year Later, Gel II Has Transformed My Nails and Salon! Ok, it’s taken me some time to get back to you (sorry!) but here we are just over a year later after I first published this review. I don’t really know where to begin, but what a year! I never thought when I first wrote this blog how Gel II would change everything! A few weeks after this post published, Gel II invited me to Kansas, USA to experience their Education Bootcamp. It was my first time in the States and it was an absolutely amazing week! Gel II was unlike any other professional Gel company that I had encountered and I really liked the family nature of the business and the closeness of the company with their educators. I left the US feeling exhilarated and with a nice haul of Gel II colours to really begin trialling on my clients. MY CLIENTS ADORED IT!!! 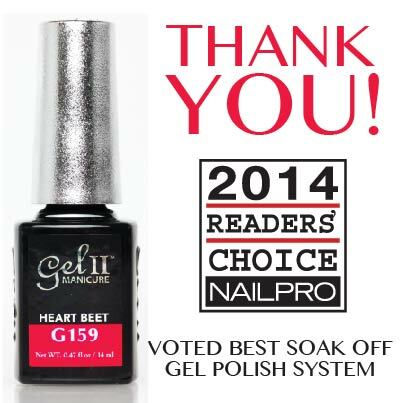 When Gel II appointments exceeded over 50% of my total gel polish appointments, I invested in 2 of their LED lamps. It was a day of mixed feelings when I removed my CND UV Shellac lamps from my nail desk and replaced them with my Gel II lamps. I will openly admit to being very scared at investing so heavily in another brand, when I had already spent thousands and thousands on CND products. However, it turned out to be the best choice I could have made! I have not had anyone request a CND Shellac manicure since Christmas 2014! Gel II is just outperforming it on every level. I think I’m now up to 120 Gel II colours and have swapped my gel enhancements product to Skyscraper Gel by Gel II, which if you haven’t tried yet, then you need to! It performs like a permanent gel but soaks off so easily. It can also be used as a smoothing gel as well as an enhancement product, my clients are going crazy for it as it feels like you have nothing on, but doesn’t lift or damage.